Knitting doyenne Katie Boyette loves to surprise people with her fun and funky creations. Once, while at soccer practice, another mother asked her what she was working on. That same toilet (the aptly named Commode-O-Dragon, complete with tiny felt teeth and a pair of hapless legs emerging from her, um, bowl) can be found—along with nineteen other whimsical toy patterns—in Boyette’s More KnitWits: 20 More Fun Projects for Those Who Love to Knit & Purl*. Knitters hankering for something other than blah blankets and pastel-colored mittens will surely enjoy the book. The monsters and creatures inside are witty and surly, flawed yet adorable, with imaginative and wry backstories. There’s Doodle, a grouchy rooster who just happens to be a competitive ballroom dancer, and Fireball, a sweet green dragon who has serious body and flying issues. Sad little Brody aspired to become an astronaut until adolescence, when his horns grew in and dashed any hopes of his fitting into a helmet. Most toys are of the small to medium range; none are larger than twelve inches. They’re grouped by knitting difficulty, with easier projects listed in the beginning of the book and the more intricate ones in the back. There are plenty of color photographs—many in detail—that show how to join parts together and create, for example, eyes and facial features. Boyette, who lives in North Carolina, holds a BFA in studio art (with a concentration in sculpture) from Appalachian State University. 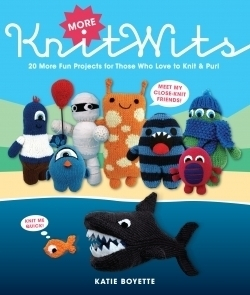 She is an avid knitter, artist, baker, and author of KnitWit: 20 Projects for Beginners and Seasoned Knitters*. She sells some wares on Etsy.com and blogs at http://caffaknitted.typepad.com. Both beginning and expert knitters—and indeed, handy crafters of all sorts—should find something appealing inside the playful tome. Who knows—it may even inspire some novice knitters—this reviewer included—to pick up a pair of needles and embark on some wild, wooly, witty adventures of their own.